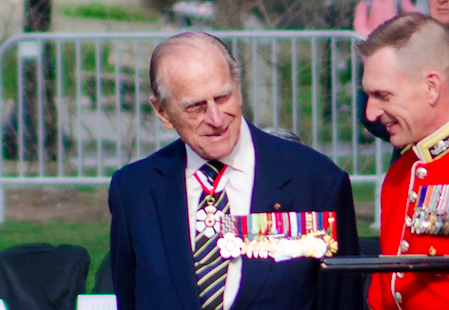 So everyone in the known universe is criticising the PM for making the Duke of Edinburgh a Knight of the Order of Australia. I might have a go too. Much has been written about the hideous anachronism of the reintroduction of the awards of knights and dames and rightly so. Long ago, we shrugged off the apron strings of the British empire and became our own entity. So much of this stuff is Back to the Future comedy. I am paused to wonder whether there is some sick Blackadder type humour in all of this. I reckon that Angus Houston is indeed a true hero of our beloved country and should be recognised as such. But rather then make a knight of him (and we respect his humility, so obvious in his entire career), we should have given him Sir Peter Cosgrove’s job in the first place. But what kind of brain snap made the PM give a knighthood to a bloke who has more unearned bling than a marshal of the Russian Air Force or a North Korean general? What part of the diminution of the Companion of the Order of Australia, carried so proudly by great Australians is a good idea? What part of licking the boots of the aristocracy of another country, rendering Australia to the status of a colony yet again is a good idea? What has the Duke ever done to make this country a better place? It is quoted that the Duke of Edinburgh Awards system has given young Australian such a positive opportunity. Yeah, well, the Duke didn’t start it. He just lent his name to it to give it prestige in much the same way as the Churchill Fellowship bears the name of a former British PM. From where I sit as an Australian by choice, having been born in England, this is an appalling insult to the whole country and everyone in it, and not something done in my name. It shows an appalling lack of judgment on the PM’s part and a lack of regard for the community at large. It demeans us all and shows the PM’s disregard for the consultative process which should be part of the process of governance. Captain’s pick is garbage. It also shows the lack of courage from his parliamentary colleagues who don’t have the guts to stand up to him and tell him to pull his head in. Since he won’t go to an early election, and he has the triggers for a double dissolution, I am happy for him to stay in his job. He made a good leader of the opposition before the election and is making a good leader of the opposition right now. He’s the best thing for the future of the ALP than anything else. Why would you want to do this? Like Sir Robert Menzies, he wants to be Sir Anthony Abbott. I saw Green Senator Richard DeNatale on ABC News 24 a couple of hours ago (ABC loves The Greens). He said GPs in Queensland are now charging $100.00 a consultation to offset their losses from the $20 rebate that the evil coalition withdrew. So, we taxpayers are slugged with anther $20 co-payment to offset the doctor’s income loss because their mates in Labor refuse to force the bludgers in our society to pay $7. DeNatale also said the coalition’s ongoing attempts to introduce a $7.00 co-payment has been universally condemned. Really? I don’t recall a vote being held on that one. Maybe, but a lot more than you have offered. The “general” state of Australia’s economy is good, if you ignore Labor’s massive debt that can never be repaid. The RBA stated its reasons for the rate reduction which is very small. Sure, there are revenue problems but these can’t be addressed because of Labor and the other riff-raff in the Senate continue to lock the reforms. Given the volatility of the global economic situation, interest rates could change direction very quickly irrespective of the state of Australia’s economy. There is actually no measuring stick that confirms the debt is massive. Its just Liberal party spin. As a % of GDP its low, much much lower than just about everyone else in the world. Many economists actually feel the debt could be naturally repaid if no changes to spending are made once revenue increases again. also its been shown that revenue as a % of GDP has been very steady hovering around 24-25% of GDP, despite what the Liberal party says, the facts actually say otherwise. Revenue however has dropped to around 20-21% GDP and had been up around 27% of GDP. That is the problem with the federal government. They have an ideological agenda of cutting spending now and then when revenue increase there is room to cut taxes again. The problem is essential services start to suffer cause there is no money to pay for them. Paying less taxes usually only helps those with high disposable incomes and not the lower and middle class masses. The budget facts would disagree. Where has revenue been ever up around 27% of GDP? Revenue definitely took a hit during the GFC and Labor correctly increased spending to deal with it. That revenue has however been steadily growing again although it isn’t back to where it was as a % of GDP during the Howard years, which were clearly boom years. Whilst not denying that there are clear and obvious revenue measures that should be taken, there is no doubt that spending growth needs to be curtailed and it isn’t solely a revenue problem. Both Labor and the Liberals have failed in enacting policies to rein in the growth in spending programs which will clearly become unsustainable in the medium to long term due to our ageing population. The roll of the RBA is to try and meet an agreed inflation rate by controlling interest rates. It does this in response to economic indicators which in turn are driven very much by government policy, and of course outside influences like the GFC. So what the government does, basically government policy has a direct impact on the economy and indirect on intrest rates. Now if your disagreeing that government policy does not drive/influence the economy and hence the actions of the reserve bank then you must be the only Liebral supporter to think that way. Remember John Howard, used to say “…I will guarantee that interest rates are always going to be lower under a Coalition government” Of course half right. The bit that is right is he knew that his governments policy could influence interest rates, but wrong that they would always be lower under a Coalition Government. Then of course we have the current Treasurer who seems to be a bit confused about it all, so I can sympathise with your lack of knowledge on the subject. Mr Hockey said the rates decision would lift business and consumer confidence. “The shackles are off the Australian economy,” he said. Now to show how silly and/or hypocritical this man is, above he is saying how good it is to have a cut and how it would increase confidence, yada yada yada. Hmmm one thing when in charge another when in opposition. Sums up the Government perfectly. Well, the RBA has cut interest rates another 0.25%. This is well below the “emergency” rates that were set several years ago. I can’t see what it will achieve apart from inflating the share market and increasing the size of the housing bubble. The dollar has fallen sharply which may help exporters but it will also increase prices on about everything we consume. Considering the dollar has lost 25% of value in the past 12 months we can expect prices to increase commensurately in the next few months. I went shopping at the mens’s shed yesterday and prices are all up at least 10% on pre-Christmas ones. It’s the same for white goods and home entertainment stuff. God only know what the price increase on a new home will be. Expect the Canberra tram project to blow out a few hundred million. The days of cheap petrol are numbered. Higher inflation and lower employment is not what we want but thats what the RBA has ordered. A probable consequence will be the winding up of a lot of SMSFs in pension mode. And who is in charge? Hmmm but its Labors fault. Once again, you are not reading the data. This is all the doings of the RBA. Nothing to do with Labor or Libs. The RBA is independent that is for sure, but their decisions are based on the general state of the economy. Who controls the general state of the economy, yep governments and who is the current government? Yep the Liebrals. So your saying that the government doesn’t have control over the economy. Yeah right, seriously? Not since banks were deregulated they don’t. It was controllable before this as governments could “pull the right levers” (like adjusting SRDs and minimum home loan deposits etc.). An induced credit squeeze usually sorted out incipient housing bubbles. The media is running the country at this time. Just like Labor sold QR you mean? I did say Labor, not Liberal. You are still reading my posts incorrectly. Yeah I know who privatised them, so yes reading correctly. The government doesn’t have full control. They can lead the economy using a variety of methods, but they don’t tend to make major changes due to the unforeseen effects. Both sides generally take a softly, softly approach. Occasionally you get a big change, like GST, or floating the dollar, etc, and the real effects of these can take quite some time to manifest themselves. A big part of the issue is working out what we actually want to economy to look like. For example,do we want 100% employment? No, that would drive inflation through the roof and would be more damaging and costly than paying the welfare of a half a million or so unemployed people. Do we want to restore Australian manufacturing to its former glory? Sure, but only we’re happy to accept higher prices and potentially lower quality goods. Maybe that’s the discussion the government should be having with the public: what do we want our economy to look like? If you read carefully I said “I THINK the debt was about $90 billion”. If you add in unfunded government superannuation and contingent liabilities like local government debt it would have probably exceeded the figure I suggested. I concede that Labor left the ship in good state then – only a debt of $64 billion – an excellent result. The reference to Labor winning by default is simply echoing what your comrades said on other threads when they were commenting about Abbott’s win in the last Federal election. Yeah you think, and therein lies the problem. Way too many people think rather than look at facts. Then they sprout their thought bubbles as fact and we get the situation we are in, when reality is different. Even now you seem to be denying the facts, you are now adding in super liability and LOCAL CGOVERNMENT debt to somehow justify your $90b. Never mind of course the figure of $64B came from a report commissioned by the then new government. A report that many acknoledge was loaded, so $64B is worst case sceonario anyway. As to whether $64B is bad it all depends. There are times when debt is more than fine and the actual number really depends upon the ability to service the debt. Interesting no comment from you about your other claim that the LNP reduced debt in QLD, when the opposite was true. Makes you wonder what they did with all the savings they got from their slash and burn, it sure the hell didn’t go to debt servicing did it? Same with the Federal Liebrals, their last budget was all slash and burn, but not one cent to reducing debt, rather reducing tax liability to the wealthy and corporates. I said they were making inroads into the debt. You seem to have difficulty in reading what I say. Governments always project budget estimates over 4 years but with the falling off of mining royalties the debt could end up higher. It most certainly will if Labor get back into power. How can adding to the debt be making inroads. Sounds like weazzle words straight out of the Liebral play book. Next you will be blaming Labor and the upper house for not letting Newmans reforms though. Not that they have one in QLD, but never mind the truth hey? Ironically after the Newman government there have been calls for an upper house in QLD. Read the following and choke on it. The latest Qld budget papers reveal a debt of $80 billion and plans to reduce that debt by $25 billion. In the meantime, Qld, with a lower than AAA cedit rating is payng $4 billion a year on debt interest. Aspirations don’t make reality do they? I mean to say before Labor got tossed out Federally they had a budget plan not unlike this that showed debt would be paid down too. Odd quicker than forecast in the last budget by your Liebral mates, though the Liebrals wanted austerity for those less well off and tax cuts and handouts to the upper end. Hmm. But I guess the difference in your eyes is Labor it is not true must be lies bla bla bla, but same document written by the Liebral well that must be the one and only truth. And oh with QLD the debt was only being reduced by selling, oops in LNP talk lease of state assets. That’s one way of course, but sell your assets, especially the money making ones then further down the track you have income issues, so a short term measure at best. It also begs the question why if the only way to reduce debt was to sell the states assets why they went through their massive public service sackings and service reductions. It is all ideological pure and simple.